Third parties are able to use the small diagnostic port hidden inside one of the Apple Watch's lugs to charge the device, according to one accessory maker, opening up the possibility of a "Made for Apple Watch" program down the line. "Our engineers have been able to independently confirm that the 6 pin diagnostic port underneath the Apple Watch case can be used for charging," the designers of battery band Reserve Strap wrote in a recent website update. This is undocumented functionality, and there is no word on whether Apple will allow continued access via the port. 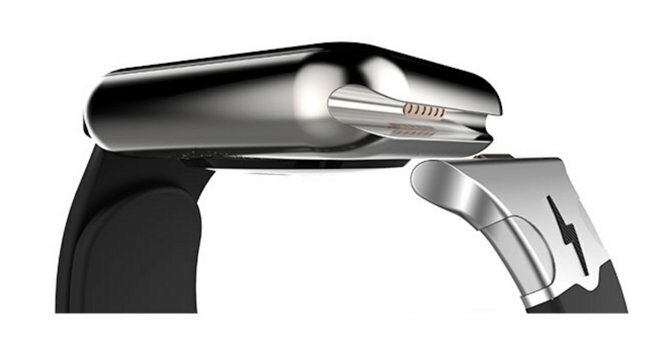 If Apple does allow development of accessories such as the Reserve Band to continue, it could presage the introduction of a "Made for Apple Watch" program akin to the "Made for iPhone" program that licenses access to the Lightning connector. This is exactly the scenario envisioned when word of the diagnostic port's existence first surfaced earlier this year. Alternatively, Apple could restrict the use of the diagnostic port via a software or firmware update. This is more in line with the company's stance on iOS-connected accessories, where Apple seeks a modicum of control over the quality of its ecosystem. Apple has yet to publicly discuss the Apple Watch's diagnostic port or its uses.